Monday , September 21 , 2015 : Janab Shaukat Abbas Zaidi (Son of Haji Janab Zahid Husain Zaidi) who was suffering from prolong illness passed away at 6 AM on 21st September 2015 in Jaypee Hospital, Noida. He was 51. He is survived by his wife and 4 children. He was a teacher at the M.M. Inter-College Chandpur. He was a fabulous human being , down to earth and had a great sense of Humor. He will always be missed and May Allah Grant him the high place in Jannat. Please recite a surah e fateha for Marhoom Janab Shaukat Abbas Zaidi (Son of Haji Janab Zahid Husain Zaidi). 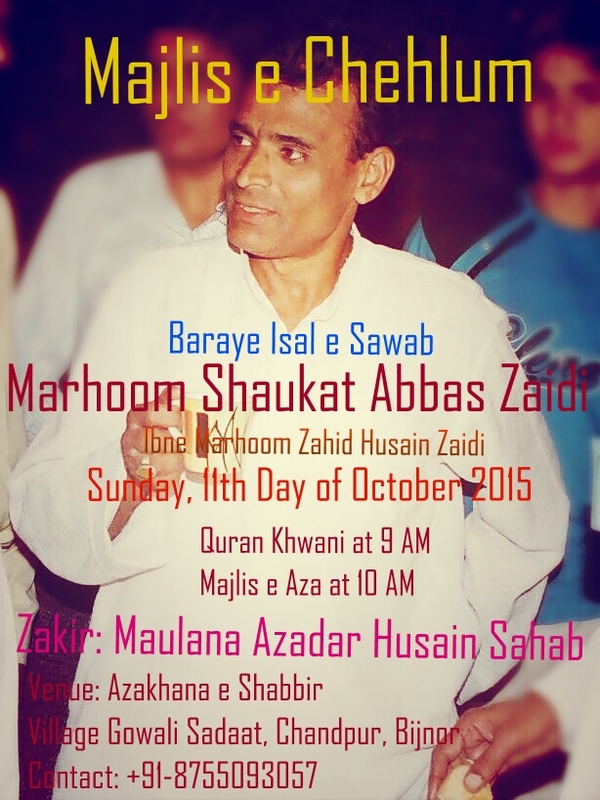 His chehlum will be observed on 11 October 2015 at Gowali Sadaat - Khitabat - Janab Maulana Azadar Husain Rizvi sahab.